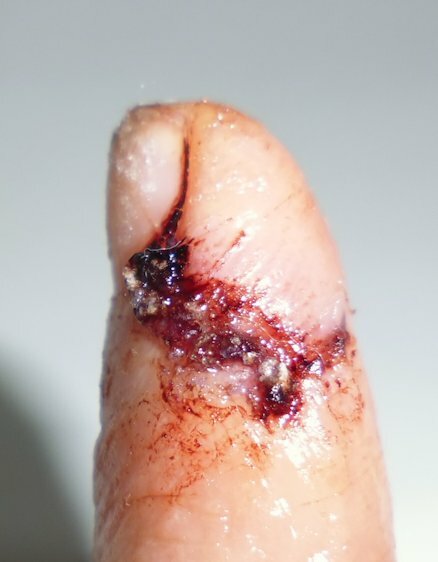 Quilting is a dangerous hobby! The only time I’ve ever been to an ER was because I spiked myself in/near the femoral artery while quilting. Until Monday. I had a wonderful 4-day quilting weekend away with some very special gals, and was on my final three strip cuts to finish my 6th quilt top for the weekend when the rotary cutter jumped the edge of the ruler and took out part of my thumb (end of the nail and several layers of skin) and a big slice out of my index finger (I think it would’ve been much worse had my thumb not partly stopped it on its journey). I’d made several scrap quilts on the weekend so had used the rotary cutter hundreds of times. But that didn’t make any difference. 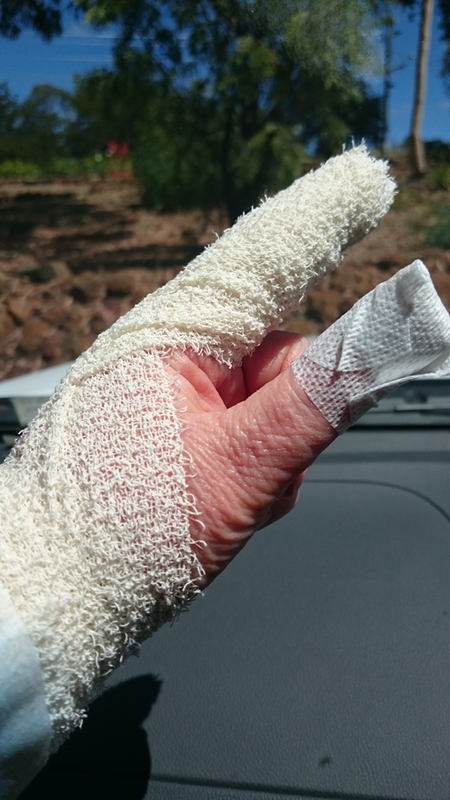 My friend Bobbie (an ex-nurse) was able to strap the main injury to my index finger tightly and take me to hospital where we spent three hours in the ER (at least two of which was waiting, me with my hand raised). 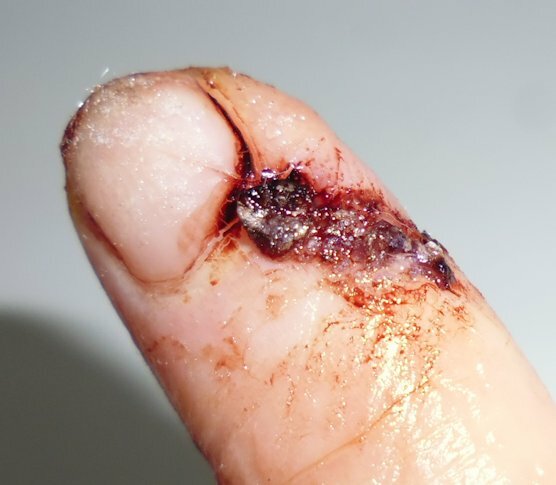 Once I was in, the medical staff checked it out, put on some stuff to stem the blood, put some ‘glue’ stitches (no anaesthetic required) in my index finger (nothing could be done for the thumb except dress it; it was mostly a cosmetic injury anyway), gave me a couple of painkillers, and instructions not to remove dressings for a week, and I was on my way. I’m fine. No pain at all, surprisingly, though it hurt like crazy (plus throbbing) after I did it and while I was waiting to be seen. I’m now looking online for a rotary cutter ruler guard or protective gloves (the Klutz gloves from Fons and Porter look like a good option). The lack of pain is the most surprising — I sliced into a fair chunk of skin, though not to the bone as I’ve heard others do (shudder). 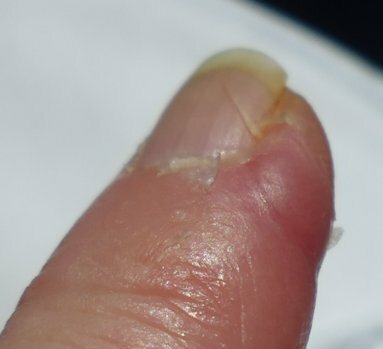 The thumb was a light injury in comparison to the index finger. 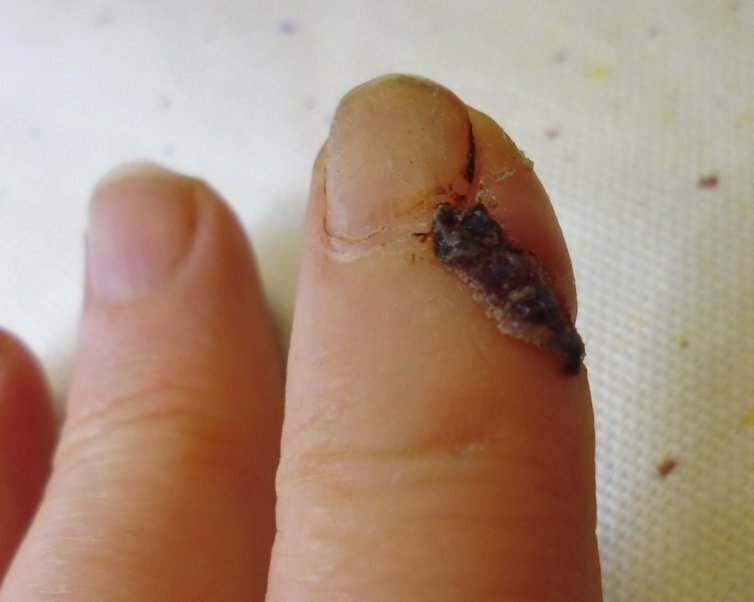 Mostly, part of the nail was sliced off and several layers of skin behind that part of the nail. I think that hitting the thumb first caused the rotary cutter to slow down a tad and perhaps deviate a little, thus resulting in a less serious injury to my index finger. 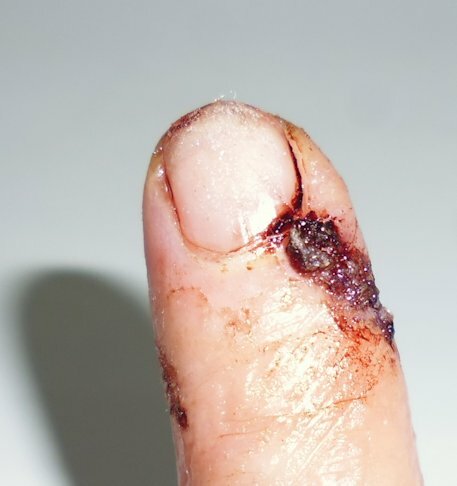 And my index finger, looking pretty ugly on removal of the initial dressings. I’ve since dressed it again, but obeyed the ER doctor’s instructions not to remove their initial dressings for a week. The very dark lumpy bits are a combination of dried blood and the glue used to hold the skin together, in lieu of stitches. It looks far worse than it feels! 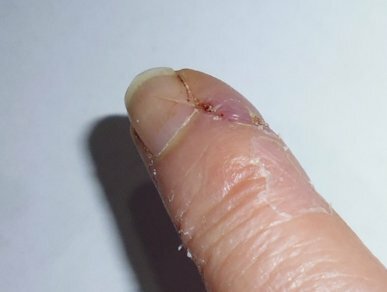 Although the site of the cut is tender to touch, I’ve had no pain since the first few hours after doing it. I’m keeping everything dry by wearing a disposable kitchen/food handling glove in the shower and when I prep food. And will keep changing the dressing on the wound every couple of days now until it’s completely healed. Two weeks’ on and I’d taken to exposing it to the air. I was still showering with a glove, but the dressing — if worn — was minimal and just to stop me from ripping the wound. The wound looks far worse than it it — it’s just dried blood and glue. Still a bit tender near the wound site and some lack of feeling in the side of the finger pad, which I believe will come back over time. I’d been exposing the wound to the air, water, etc. 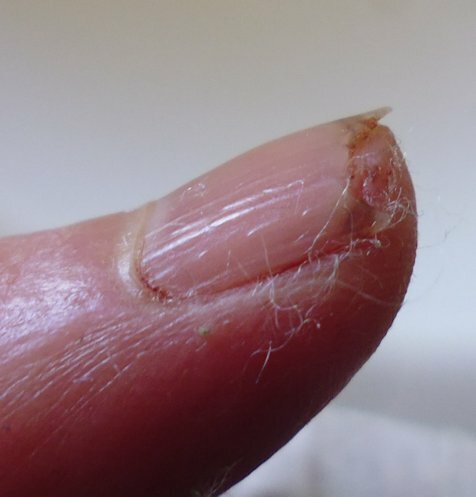 and finally the last of the glue fell off some 19 days after cutting myself — now I can see the (superficial) mark in the fingernail where the rotary cutter went! The wound site is still a little tender, and I have small areas on the side of the finger pad where I can’t feel anything, but the colour is good so it’s just a bit of nerve damage, which I believe will eventually heal and regenerate. Still slightly tender but it’s coming along well! I’ve now purchased a Klutz glove and am using it religiously! 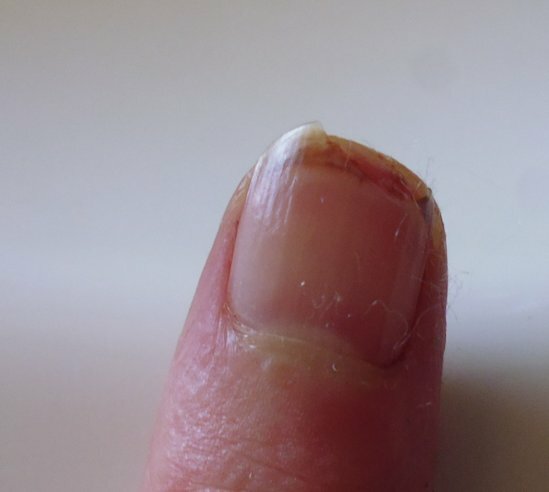 And my finger has completely healed – you can hardly see the scar. 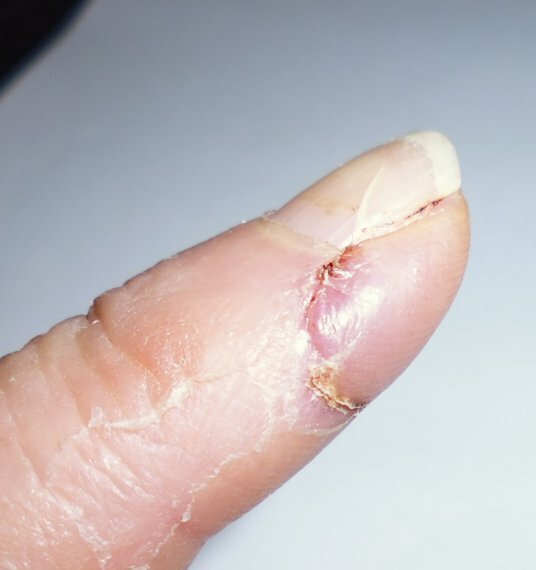 I still have a little tenderness and lack of feeling along the side near the nail, but the area is gradually getting smaller. 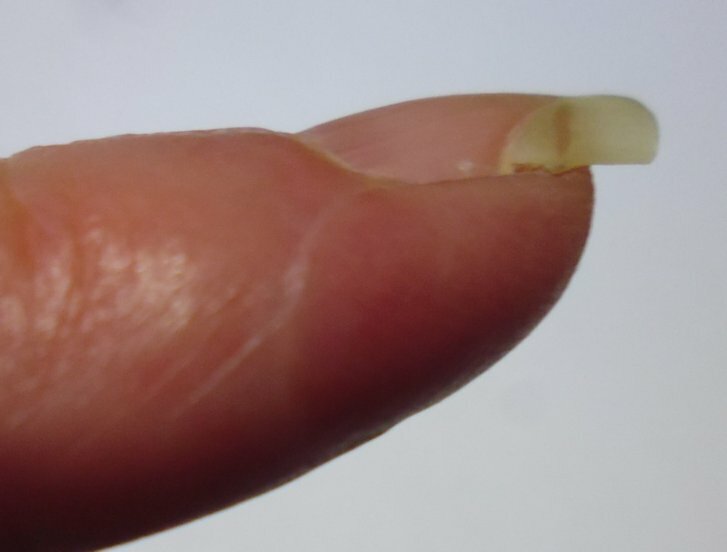 And since I took these photos, I’ve put Super Glue on the cut part of the nail to prevent it tearing too soon. Rhonda, I did almost the identical thing in early December minus the thumb part. 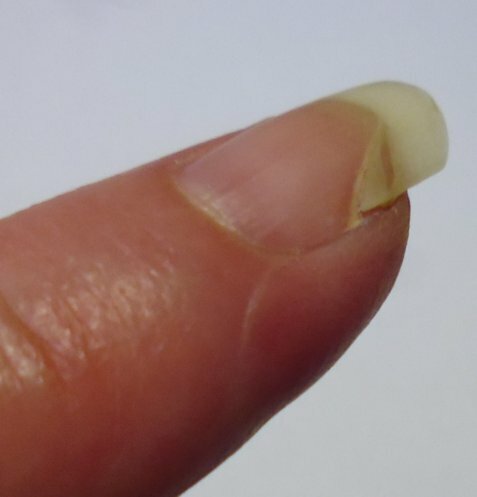 I cut quite a chunk out of my index finger including part of the nail. I have a ruler guard on the 6×24 ruler I use 99% of the time. I was cutting 8″ strips and was using a ruler without the guard. I also ended up at Urgent Care and needed Gelsorb to stop the bleeding and a pressure dressing. The 8.5 X 24 ruler now has a ruler guard. I HIGHLY recommend them!